The lights dimmed in JVC’s mini theater at this year’s Consumer Electronic Show and the million-dollar projection system kicked into gear. My sight became enfused with a Japanese pagoda set among stunning rocky outcroppings and brilliantly colored pink flowers. Each detail painted before my eyes as though I was peering through the wall itself to the world beyond. Everything was displayed on a giant projection screen that had over 4K resolution–about four times as good as the best HD. It was the highest fidelity image I have ever seen rendered before my eyes. The screen retracted and another came into view. The JVC rep prompted us to put our our 3D glasses. The screen was filled with dimensional images of fish swimming among the vivid reefs and coral. The text displayed onscreen was a bit off giving it a double image instead of a crisp 3D pop. I remember thinking, bring me back to the 4K Japanese Pagoda. The underlying theme for CES was undeniably 3D TV. On the heels of Avatar, which has grossed over $1 billion at the box office worldwide, it would seem that every manufacturer is gearing up to provide the experience at home. Every company from Sony, Samsung, Sharp, to Nvidia is toting their own version of the 3D experience. Even TV networks were in for the run sporting 3D channels such as ESPN and the upcoming Olympics all set to show in 3D. Although 3D TVs seem to be imminent, there are many reasons why this technology will suffer slow inception into the consumer experience. It makes sense as to why these companies are moving to 3D and as quickly as they can: 3D is the natural progression of the viewing experience. Where else do you go when resolution is good enough? 3D will require a new screens, better processors and imaging, cameras with two optical systems, and better data pipelines to stream content. Hardware providers would love to sell the world new devices and systems. The movie industry has profited substantially from second and third sources as consumers re-buy content to own after attending theaters. By outfitting the home with the 3D experience, studios can further their content and reap the additional revenue sources. However, in order to to so, consumers must be completely re-outfitted at the very least with new televisions. 3D technology is not that far beyond state-of-the-art. Moving from a bottom of the line LCD TV which already renders digital content at 120Hz to a new 3D display which renders an image for each eye utilizes the same principles. Given the ease of production, many companies are producing their own version. Whenever a new technology comes to bear, there are usually several players that compete with similar albeit incompatible solutions. As each company has developed their own methods, the market now has multiple solutions. I distinctly remember taking my Real D glasses from the Sony booth after an interview with the makers of Cloudy with A Chance of Meatballs which had behind-the-scene 3D screening over to the newest 3D HDTVs to experiement. 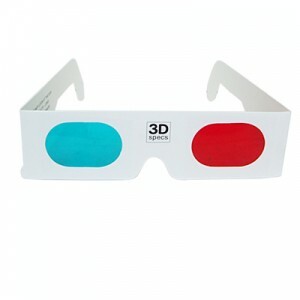 The 3D movie glasses did nothing for the 3D HDTVs. I came to find out that some companies developed active eyewear, no doubt to help promote content that was originally captured in 2D in order to better render it in 3D. Other companies produced 3D content either through full CGI features, like Sony Pictures, or using stereoscopic video cameras. Who will be more powerful, the movie industry or the consumer TV industry? As with any new technology, it will take several years to sort out a clear winner. In the meantime, the savvy consumer will sit back much in the same way we all waited for HD-DVD and Blu-ray to finally claim a victor. For 2010, the multiplicity of technologies will stagnate sales of any company’s 3D devices or technologies. The world market has by many standards just begun its High-Definition upgrade. As HDTV prices have fallen and TV content has shifted to digital, many individuals have finally made the investment in a new HDTV. The American market, unlike Japanese markets, follow a very slow upgrade trade especially when it comes to TVs. The HD switch, by all accounts, has been a excruciatingly slow transition fraught with delays and economic stagnation. We are still at the tail end of the HD upgrade which has not penetrated deeply and wide enough for a refresh. The industry still has not solved the problem of content distribution. Although there is a small bevy of movies that have been produced for the 3D markets by the likes of Sony and Dreamworks, 3D content is still at a vast minority. At CES there were several booths that had demos of post-processing 2D content into 3D–something NVida is pushing with their new multi-projection systems and new 3D laptop. But by far, content is 2D, not 3D. The biggest challenge to 3D content besides content itself is something I’d like to call the media consumption paradigm. Think back to the last movie put on at home or last television viewing. If you are anything like me, very few movies or television shows were consumed by exclusive watching content for the entire duration. Netbooks have become the perfect couch companion for casual television/internet perusal and movies for me come more in the form of something to put on in the background or simply catching a portion of something on my phone, rather than something that subsumes my entire attention. There is the underlying bane of 3D wear. Viewing 3D content requires eyewear that polarizes the view for each eye. The requirement of eyewear is a significant detractor, especially for anyone who multi-tasks while entertained or for anyone who has ever lost the remote. 3D images are completely useless without the eyewear and the eyewear renders doing anything else useless. All this being said, there are ways for 3D to be very successful. Doing so requires killer applications that solve the paradigms reviewed previously. In order for 3D to be successful in 2010, it must penetrate into markets where the hardware technology is refreshed very quickly. Gaming is one such market. NVidia is very well positioned to support the 3D experience. PC Games break the viewing paradigm by requiring all of an individual’s attention. The more immersive experience, the better. Other gaming areas like soccer and american football may be very successful in 3D for the same reasons. All in all, despite CES’ and the industry’s well funded efforts to bring 3D to the mainstream in 2010, the technology will have to wait. In the meantime, perhaps we can sort out digital content licensing, HD streaming, and better connectedness. 2010 is shoring up to be a sleeper year in the area of new consumer devices.